It took me a while to finally taste this tea. But I didn’t hesitate with this tea because I didn’t think I would like it. In fact, I was quite certain I would enjoy it. I love lavender, I love currants, so I felt that this tea had a lot of potential, even though it is a rooibos blend. The reason I postponed trying this tea is because of the name. I wanted to save this tea to review closer to a patriotic holiday … like the 4th of July. But the 4th came and went and I had forgotten about this tea. So… here I am now a couple of months after July and I figure that now is is as patriotic a time as any. And really, do we really need a reason to celebrate our patriotism? Especially if that patriotism is demonstrated through tea! 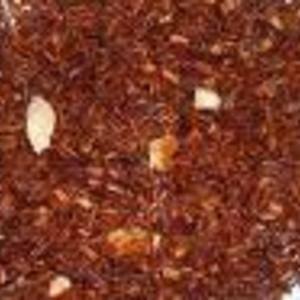 This is a delicious rooibos blend. It has a very nice amount of lavender essence, providing a beautiful, heady scent and delicious, sweet flavor without tasting too lavender-y. I love lavender, but it can be a little too much at times. Here, it’s just right. The rose adds a hint of flavor that proves to be very harmonious with the lavender notes. The elderberries and currants add a tasty berry flavor that is pleasantly tart. That tartness offers a nice contrast to the sweet floral taste and gives the overall cup a nice sense of balance. Tasty! The currant flavor is strong, providing a delicious sweet with just the right amount of tart taste. There is a nice little tangy berry twinge in the aftertaste which is quite nice. Also – notably absent in the aftertaste – is the saccharine-y sweet aftertaste that some rooibos blends host. I can taste the woody/nutty/somewhat tobacco-y taste of the rooibos here, I am not getting that sickly sweet taste of the rooibos. 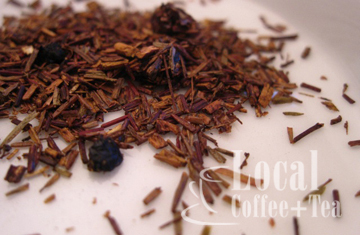 The flavor of the currant melds well with the flavor of the rooibos, creating a very interesting cup. I like this rooibos blend. It is not overly sweet but is still sweet enough to make a delightful dessert cup – or perhaps a sweet treat just before bedtime? It is one that you’ll feel good about serving to the kids too – it is not only loaded with antioxidants (thanks to the rooibos) but it is also naturally caffeine free and sweet enough that you don’t need to add a lot of sugar to get them to drink it!